Here is THE software I can't live without since the beginning of the 2000s: a very efficient and fast Windows file explorer replacement, even on older machines. 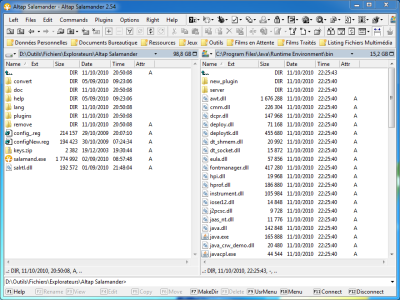 It brings back all ideas introduced by Norton Commander, displaying two file lists side by side, to ease file and folder operations between two given paths or disks. A big feature list for this extremely stable and fast utility, coming with a cheap license ($30) lasting for several years as updates are quite delayed between versions. Of course, there are free alternatives (including the first version of the same software) but they're far from having the same features are Salamander. If you're frequently working on several computers, you've been already faced with the issue of keeping data up-to-date on all machines. SyncBack is a file backup and synchronization software which will be very helpful with this process, by updating only files which have really been updated. From its simplified interface, you can create several synchronization or profiles for any file or folder group you want to manage. Each profile can hold a list of what you want to include or exclude, and comes with several comparison criteria to find which files have to be updated (date, contents, size...). You can then run several profiles simultaneously (separately or grouped), in simulated mode (to check what's going to be updated, and ultimately change what to do for each element) and/or real mode to apply all updates. Of course, you can schedule any backup or synchronization profile to be run automatically at a given time. An excellent tool, with many options (compression, FTP file transfer...), fully functional in its freeware variant, but also available in a paid version if you need it.